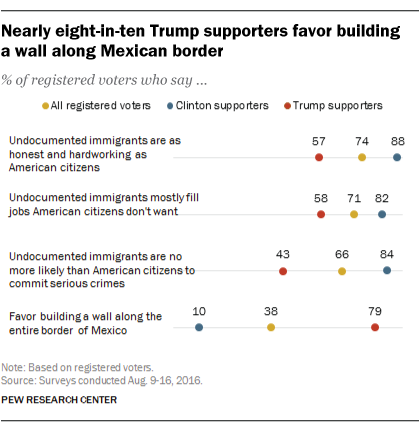 Voters who supported Donald Trump in the presidential election view illegal immigration as a serious problem in the U.S. and strongly favor his proposal to build a wall along the southern border with Mexico. But they are more divided on other questions, including whether to deport some or all of the nation’s estimated 11.1 million unauthorized immigrants. About eight-in-ten Trump supporters who cast ballots or were planning to in the days leading up to the election (79%) said illegal immigration was a “very big” problem in the U.S., according to a Pew Research Center survey conducted just before Election Day. Even more (86%) said the immigration situation in the U.S. has “gotten worse” since 2008. But while 79% of pro-Trump registered voters said in an August survey that they favored building a wall on the Mexican border, they did not take as hard a line when it came to the status of those who are already living in the U.S. illegally. In an October survey, 60% of voters who supported Trump said undocumented immigrants should be able to stay in the U.S. if they meet certain requirements, compared with 37% who said they should not. Only about a third (32%) of Trump supporters said there should be a “national law enforcement effort to deport” all undocumented immigrants. However, half of Trump supporters said undocumented immigrants are more likely than U.S. citizens to commit serious crimes. Among all registered voters, just 27% expressed this view. Since the election, Trump himself has continued to address many of the positions he articulated on the campaign trail regarding illegal immigration. In an interview shortly after his election, he again promised to build a wall on the southern border and said his administration would seek to deport up to 3 million unauthorized immigrants with criminal records, leaving open the possibility of deporting others in the future. In Pew Research Center’s post-election survey, conducted Nov. 10-14, more than half of Trump supporters (55%) said they have confidence in the new president to “do the right thing” when it comes to illegal immigration. Trump scored higher among his supporters on two other issues (the economy and the threat of terrorism), and about the same on a third (health care). John Gramlich is a writer/editor at Pew Research Center.